Soon Toyota, Honda, Mitsubishi, and Fiat Chrysler will be putting a new crossover on sale. What’s weird is that they’re all the same exact car. And none of them designed it. But where they will be selling it gives a bit of a clue why all this is happening. The actual designer of the vehicle is Guangzhou Automobile Group, or GAC. We know it in the States for its Trumpchi brand that has showed up to a few auto shows over here, ironing out its translation problems and getting used to how things are in America. The car in question is designed to be available as either a plug-in hybrid or full electric vehicle, which explains why these four other car companies want it. You’ll forgive me for being slightly confused by all of this as Trumpchi’s site is in Chinese but the gas version of the car is called the GS4, the hybrid is the GS4 PHEV, and the EV is called the GE3, which is supposed to be based on the GS3, though the GS3 and GS4 are both based on the same GA3 sedan, but I’m really starting to confuse myself at this point. The approach — atypical in an industry in which distinct design is key to gaining an edge — will help them meet China’s new, stricter emissions standards more quickly, giving them time to keep working on their own unique electric models. Carmakers are trying various tactics to avoid being placed at a disadvantage by the new regulations in the world’s largest auto market. Designed to make China’s roads greener, the rules favor electric-car makers while presenting a threat to the profit margins of the vast majority of auto manufacturers that still rely on gas guzzlers for most of their revenue. What’s wild is that these four variations of the crossover really will be very clearly the same car. The different models will only have different badging on the rear of the car, as Automotive News China reports. Up front there will only be the same, uniform Trumpchi badging. And it’s a car that’s been on sale for a hot minute already, even though these regulations are new. 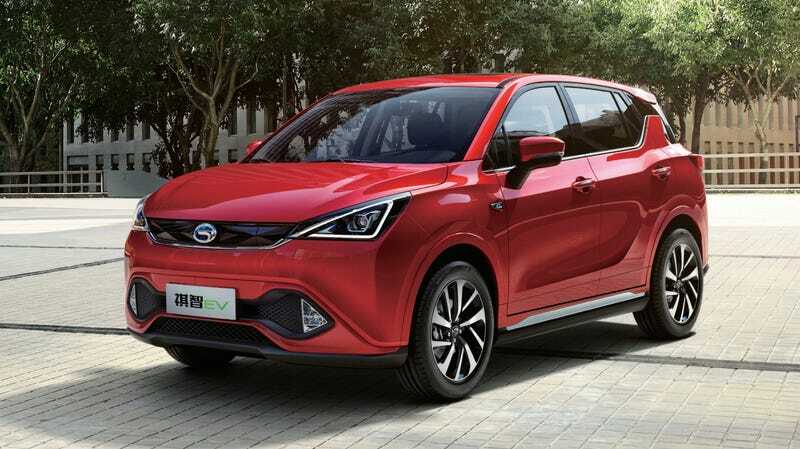 The regs come into play in 2019 while the hybrid version of the Trumpchi has been on the market since 2017, the EV since 2016. Apparently it was a hit on debut. Again, this is a quick fix. Toyota, for instance, reportedly won’t have an EV of its own ready until 2020. The Mitsubishi Eupheme, if you’re wondering about specs, has a claimed range of 410 km (255 miles) on a single charge under the Chinese test cycle, and it costs about $20,000 after subsidies, as InsideEVs reports. We’ve seen a bunch of tech partnerships over here in America where hybrid systems themselves were jointly developed across different companies, but those same tech systems were used in distinct cars. We’ve even had cars that share a same general platform but used different designs. (The Alfa Romeo 164/Saab 9000 comes to mind, a cost-saving plan for those smaller brands back in the day.) But I don’t think we ever had something like this, where a whole car is shared. It goes to show that the pressure to make hybrids and EVs is stronger, relatively speaking, over there than it has been over here. In a way, this four-way sharing is a good sign.